The Visual Composer theme integration feature that’s released in the 2.10 update is a real treat to WordPress theme developers who now have the opportunity to build professional and well-structured themes to bundle them with the world’s class website builder. There are so many things you can do with the built-in set of elements the Visual Composer website builder comes with - elements, templates, and constant feature updates. A very good start, right? Yes, you can integrate Visual Composer Website Builder Free version in your theme without spending a penny. This way you can offer your customers a great deal and let them receive a website builder together with your theme without extra expenses from your side. The free version comes with a lot of features complimenting the 40+ free content elements, predefined templates, features like Design Options and so much more. From all WordPress website builders, Visual Composer has the most advanced free version builder on the market offering a great bunch of features for free while competitors have packed them in a premium version. Want even more? With a help of API, you can develop your own custom elements and include them in your theme files. Visual Composer Free version really rocks! Don’t waste your time building your own page builder, instead do what you are the best at - build a great theme and make it a top seller! It used to be a trend to build a page builder for themes but those days are long gone. Nowadays, with the increased competition when time runs at sun speed, you will want to deliver your work quickly, but still qualitatively. As a successful author of the topic, it is not advantageous in terms of costs and time to develop a custom solution for your theme. Instead, Visual Composer drag and drop website builder can be integrated into your theme and offered to your buyers for free. When using a WordPress website builder, it is completely transforming the way you and your customers can create pages. If you are currently working with a theme, allowing for some or almost no flexibility, you know that there’re always limits to what you can customize. The website builder makes all these limitations disappear. When thinking about the end user it is crucial to give your customers an easy way to work with the content. 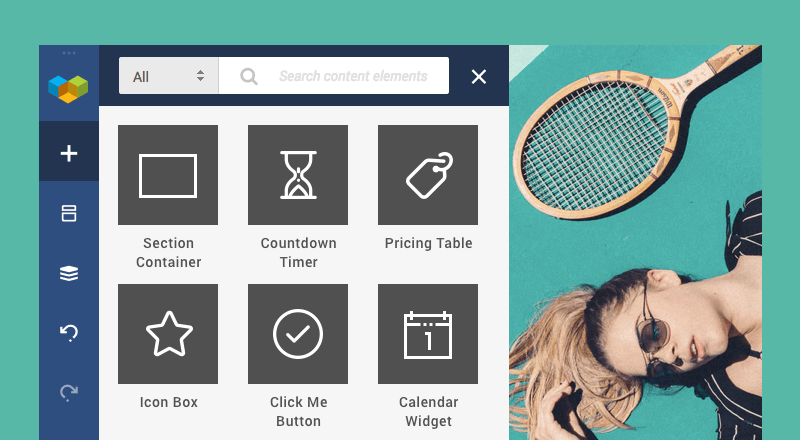 Visual Composer allows pages to be built using a drag-and-drop interface. It gives your customers the power to layout pages easily, and it gives you as a developer the opportunity to add value to your WordPress themes. There is a great developers team working behind the scene making sure that Visual Composer users get the top-trend features and constant improvements. Visual Composer is in the constant pace of providing users with a professional and modern interface for you to keep creating professional projects - websites, WordPress themes, and add-ons. Visual Composer is fully optimized for WordPress. We follow the compatibility standards between website builder and WordPress. Regarding themes - Visual Composer works with any WordPress theme that’s already on the market and those who will join in future. The website editor will complement your themes giving your customers a full package deal - your beautiful theme plus our powerful website builder. Selling WordPress themes can be a profitable business, whether you are selling individually or through a marketplace like ThemeForest. As a theme author you know the rewards, but also know how difficult theme development can be. The research shows that WordPress themes that have bundled a website builder sell 4x better in comparison to themes without a builder. And imagine the sale growth when you bundle a website builder without opening your wallet? Visual Composer lets you earn even more - it’s a win-win for you as a theme author! Offer more - develop custom elements for your theme. How to Integrate Your Theme? Integrate Visual Composer into your theme. It’s simple as that. So go ahead, use Visual Composer API and start earning more! Visual Composer website builder free version is enough to create a beautifully functional website. It’s true - more than 200,000+ downloads is a great proof. However advanced, the free version is limited and there are times when limits can stop clients from creating complex and extraordinary websites. In such case, Visual Composer Premium version is the key to the 100+ features. You can always encourage your theme users to upgrade to Premium to get full access to the Visual Composer Hub and dedicated support. Making it all even more binding, you can become our affiliate, promote Visual Composer Premium version and get additional and recurring income. Visual Composer affiliate program with 40% commission per a sale, is one of the top programs in WordPress niche. Try it out - sing up to the affiliate program and enjoy the benefits! Yeah, visual composer is only the plugin which is very simple and easy to operate. You can design your website through the visual composer by adding simple rows and other tools within it. Nowadays, everyone is using visual composer especially the beginners who are at the beginning stage of website creation. Can we purchase visual composer developer and integrated it in our themes(themeforest)? Because lately you allowed only the basic version by purscasing the extended lisense from themeforest. I want to include visual composer and not WP bakery. In fact, you can do it for free (free version). The only restriction to your users will be access to the Hub and Support. But with the API you can develop a set of custom elements – exclusive to your theme so this will lower Hub issue for them. In addition, feel free to join our affiliate program and if users decide to upgrade to the Premium you will get an additional bonus. There’s something confusing for me. I’m using your plugin WPBakery Page Builder. I’ve paid for support. The theme is OptimizeWP, which is not fully compatible with WPBakery P.B. For instance, the TAB ELEMENTS are very basic. So, my idea is swept out OptimizeWP and use Visual Composer Starter Theme. Do you give support for this theme? I did not find documentation of this theme in your website. Yes, you can use this theme with WPBakery Page Builder too. But we recommend using the Visual Composer Website Builder because it’s the new product. How can i download free visual composer website builder.I like to learn this. I used visual composer its really amazing builder. We can make a beautiful website by using this composer. Than you admin for this composer. Thanks for the nice words. Feel free to share your website so we can look into what you’ve created with Visual Composer. Hi Linda Thanks for this article but I have questions for you. Where did you find this information “grow your sales up to 400% by offering more” Is it your case study ? or got information from some source. Last question ” win-win” means, either way, you are going to win right…..
Hi Nishant, we made the research on sales for themes with and without builder integration. Themes with builder integration are way more popular in terms of sales. “Win-win” means that all parties benefit from the collaboration. Theme authors get a high-quality builder for free, customers receive builder straight from the theme, and we receive additional user that may want to convert to Premium at some point. visual composer is really an amazing builder, I used it. Thanks for confirming! And we are glad you enjoy using it. This plugin is really the best I’ve ever come across and honestly it has really saved my time, bucks and energy. I’ll personally get the premium plugin the next month. Nice! Hope we you had a chance to enjoy the Premium. Wow… Visual composer is n an exceptional builder. Thank you for the nice words. We do our best to release often and deliver more and more features that our users are asking. Visual composer is best to use with 100+ features. Visual composer is an exceptional builder with 1000+ features, its really great builder. so many features available in Visual Composer, it is best to use.i referred it to all my friend.